Samdol is a stylish girl from Lhasa, the holy capital of Tibet. 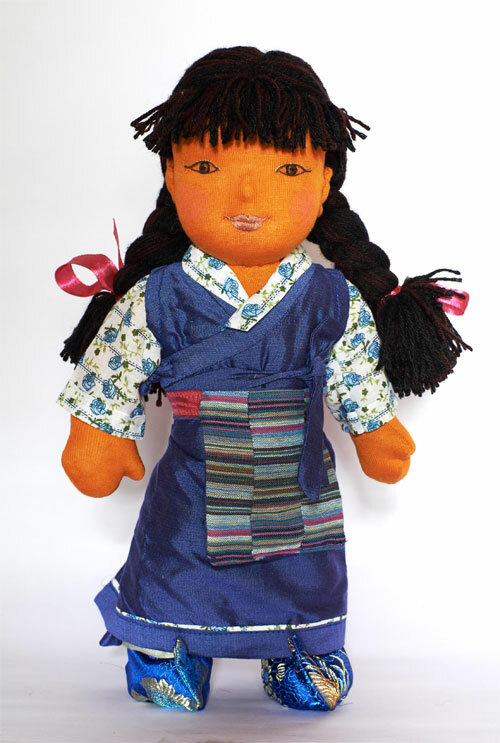 Her long hair is braided and tied together with colourful ribbons. She wears a smart summer chupa (long Tibetan dress) with blouse, a traditional striped apron, trousers and brocade shoes. As many Tibetans have slightly darker colored skin we have chosen to make Samdol with a darker tan. However, you can also receive her in our medium skin tone, for this, please mention your choice in the comments box at check out. Please note: While maintaining a distinct style, due to its handcrafted nature, each product will vary slightly and fabrics used for the garments are frequently changed. If you have any preferences for material colours or would prefer a different skin tone, please contact us via email at info@dolls4tibet.com.